CIW’s Harvest Without Violence Mobile Exhibit travels to Haverford College for a Fair Food-filled week! Students and staff from Haverford College get ready to head over to the protest in front of Wendy’s after hosting the Harvest without Violence Exhibit. Students from Haverford College, Temple University, Bryn Mawr, Swarthmore get fired up in Student/Farmworker Alliance’s Boot the Braids Campaign! Last week, the CIW’s eye-opening Harvest Without Violence Mobile Exhibit traveled from Immokalee, Florida, to the Keystone State for a week-long visit at Haverford College to educate students and community members about the Fair Food Program’s unique success in ending sexual violence and other human rights abuses in the fields. And that was only the beginning of what proved to be a full-on Fair Food week at Haverford! Today, we bring you a quick, exciting photo report from the Student/Farmworker Alliance, who lined up back-to-back events in Haverford throughout last week. Enjoy! 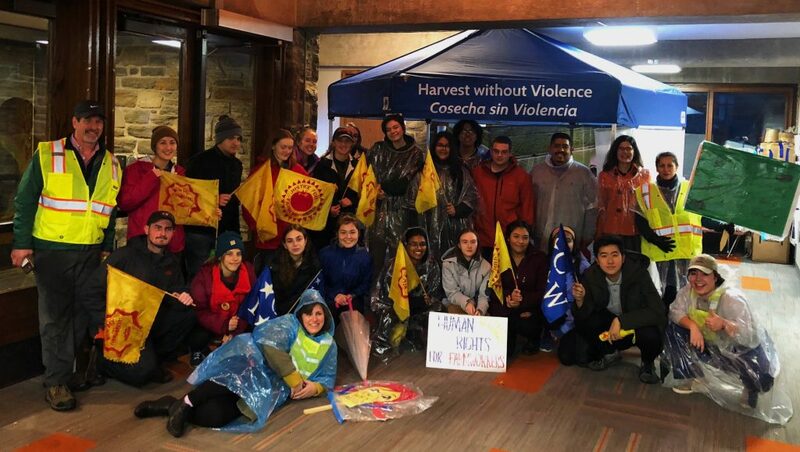 In between studying for midterms and getting out the vote last week, students at Haverford College in Pennsylvania took a pause to stand in solidarity with the women and men who harvest the food we eat. The John B. Hurford ‘60 Center for the Arts and Humanities, Philadelphia Arts Creative Collective (PACC) Program, Distinguished Visitors Program and Haverford Microfinance and Impact Investing Initiative (MI3) at Haverford College invited CIW’s co-founder Lucas Benitez and Ximena Pedroza of the Student/Farmworker Alliance to debut the Harvest Without Violence Mobile Exhibit at their dining center, educating over 300 students about the alarming rate of sexual harassment and assault confronted by farmworker women in the fields and about the only proven solution in agriculture to end and prevent such abuses: the award-winning Fair Food Program. While touring the exhibit’s legal documents, farmworker testimonies and extensive research, scores of students learned about the Campaign for Fair Food and pledged to boycott Wendy’s until the fast-food chain joins the rest of the industry in protecting farmworkers’ rights. In addition to the guided tours, the Immokalee team led a series of classroom workshops on the Fair Food Nation’s impressive organizing track record on Thursday, November 8, as well as a keynote speech titled “Holding Goliath Accountable”. Lucas drew from the biblical story of David and Goliath, painting a picture of how farmworkers – as determined and steadfast as David himself – have managed to hold Goliath accountable. The following day was jam-packed with events, including a panel on the rising Worker-driven Social Responsibility model titled “21st Century Social Responsibility” together with Penelope Kyritsis from the Worker Rights Consortium, and a representative from B-Lab and B-Corp Certification. Harnessing the energy of the newly-educated community members at Haverford, the CIW also hosted a workshop on organizing and the importance of symbolism to galvanize the latest generation of young movement leaders in the Student/Farmworker Alliance. During the workshop, students and faculty created hand-crafted signs for the impending Wendy’s protest. After the action – with everyone soaking wet, but filled with the jubilant energy that accompanies the Fair Food movement, where ever it goes – CIW concluded the week with a beautiful concert by &More, an incredible local jazz band from the City of Brotherly Love. And, most importantly, it was clear that this packed week in Philadelphia was only the beginning: Students have already begun strategizing on how all four universities – Haverford, Bryn Mawr, Swarthmore, and Temple – can work together to ensure that Temple University leaders stand on the right side of history and boot Wendy’s off campus until the fast food giant comes to the table with the CIW! This Thanksgiving, help those who make your holiday feast possible by becoming a sustainer of the Fair Food movement!